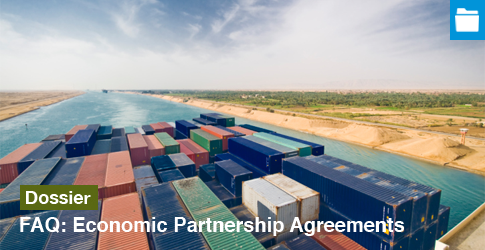 Economic Partnership Agreements (EPA) are ‘development-focused’ trade agreements negotiated between the African, Caribbean and African (ACP) countries/regions and the European Union (EU). They are reciprocal, but asymmetric trade agreements, where the EU, as one regional block, provides full duty free and quota free market access to EPA countries and/or regions and where ACP countries/ regions, commit to open at least 75% of their markets to the EU. Who is concerned so far? 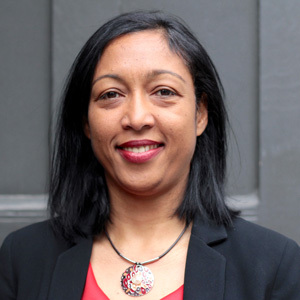 EPAs are trade instruments that replace the unilateral trade regime that governed the trade relationship between EU and ACP countries for almost forty years. The Cotonou Partnership Agreement (CPA), established in 2000, was the last one that granted unilateral preferences to ACP countries. In fact, this unilateral trade regime was considered in breach of a fundamental principle of the World Trade Organization (WTO) because it granted more favourable treatment only to ACP countries but not to other developing countries, members of the WTO. In this context, the EU was granted in 1996 a first waiver at the WTO, which expired in 2000. A request for extension of this waiver was granted in 2001, in parallel to the launch of the WTO Doha Round, after much debate, until 31st December 2007, under the condition that the discriminatory trade Cotonou regime in favour of the ACP only would be replaced by WTO-compatible trade regimes, that is either free trade agreements (i.e. EPAs), a non-discriminatory and arbitrary preferential trade regimes to developing countries (i.e. the general system of preferences – GSP), or non-preferential treatment (i.e. trading under the most-favoured nation clause –MFN- of the WTO) this time compatible with the rules of the WTO. 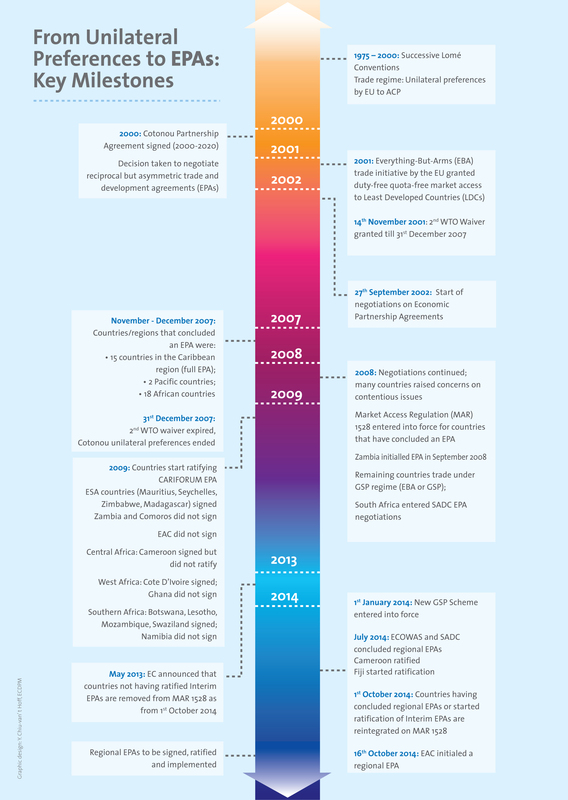 From Lomé Preferences to EPAs: What were the key milestones? Who negotiated EPAs and under what regional configuration? 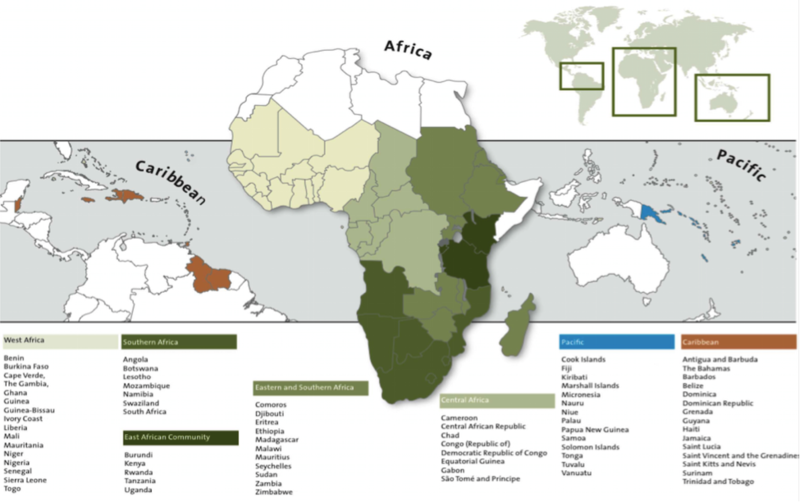 The Eastern and Southern African (ESA) region (a sub-group of the Common Market for Eastern and Southern Africa – COMESA), included 11 countries (four countries left in 2007 to join the East African Community –EAC- EPA group). In 2007, a 7th EPA group was constituted, comprising of the 5 members of the Eastern African Community. How do EPAs relate to existing regional economic communities? EPAs, as envisaged in the Cotonou Agreement, were meant to build on and foster regional integration processes in the ACP. Existing ACP regional groupings were the basis for EPA negotiations. However, due to overlapping membership of countries in several African Regional Economic Communities (RECs), countries had to make a choice. Therefore, with the exception of ECOWAS and EAC, which are at a more advanced state of integration (they have a Customs Union), the other African RECs did not negotiate with all their members. Countries members of COMESA, negotiated as Eastern and Southern Africa (ESA), with 11 members out of their 19 members. It is important to note that two COMESA members, namely Egypt and Libya are non-ACP states, and therefore did not take part in EPA negotiations. The remaining COMESA states negotiated within SADC (Swaziland), EAC (Burundi, Kenya, Rwanda and Uganda) or Central Africa (DR Congo) configurations. Similarly, the SADC EPA group consisted of 7 countries out of the 15 members. Of these, the Southern African Customs Union (SACU), which is a customs union, negotiated as a group, when South Africa joined the negotiations in 2007. The others negotiated in Central Africa (DR Congo), EAC (Tanzania) and ESA (Madagascar, Malawi, Mauritius, Seychelles, Zambia and Zimbabwe). In Central Africa, the EPA group consists of 8 members in total. These are the 6 members of Central African Economic and Monetary Community (CEMAC), a customs union, namely Gabon, Cameroon, CAR, Chad, Rep. of Congo and Equatorial Guinea plus two other countries, DR Congo (non-CEMAC but member of the Economic Community of Central African States – ECCAS, SADC and COMESA) and Sao Tome and Principe (observer status only in CEMAC and member of ECCAS). West Africa negotiated with the full 15 member of ECOWAS (Benin, Burkina Faso, Cape Verde, Gambia, Ghana, Guinea, Guinea Bissau, Cote d’Ivoire, Liberia, Mali, Niger, Nigeria, Senegal, Sierra Leone, Togo) plus Mauritania. East Africa negotiated as a block within the East African Community as part of ESA until 2006, and from 2007 as an independent grouping, with its full 5 members. Why conclude EPAs before 1st October 2014? Entry into force of an agreement is a lengthy process: it requires signature, ratification and implementation and may sometimes take years. Therefore, to prevent trade disruption pending the entry into force of EPAs, on 20 December 2007, a Market Access Regulation (MAR 1528/2007) was adopted by the EU, to provisionally apply EPA preferences as from 1st January 2008 from the EU to countries that have concluded such a deal, but have yet to sign, ratify and implement their agreements. The EU later decided, in May 2013 with the EU Regulation 527/2013, to amend the MAR to exclude, as from 1st October 2014, countries that have not taken the necessary steps to ratify the EPA concluded in 2007. Thus, these countries had to do so or conclude a new (regional) EPA to be reintegrated under the MAR 1528/2007. For those not having done before 1st October 2014, they automatically fall, after that date, under the Generalised System of Preferences (GSP), a differentiated preferential trade regime that the EU gives unilaterally to all developing countries. Least-developed countries (LDCs) can trade under the Everything But Arms (EBA) Initiative under the EU GSP, which provide duty free quota free access to the EU market for all exports, except arms, from LDCs. Non-LDCs have a less favourable regime under the GSP. Besides, according to the new EU GSP that entered into force on 1st January 2014, any upper middle-income countries would no longer have trade preferences on the EU market as from 2016. 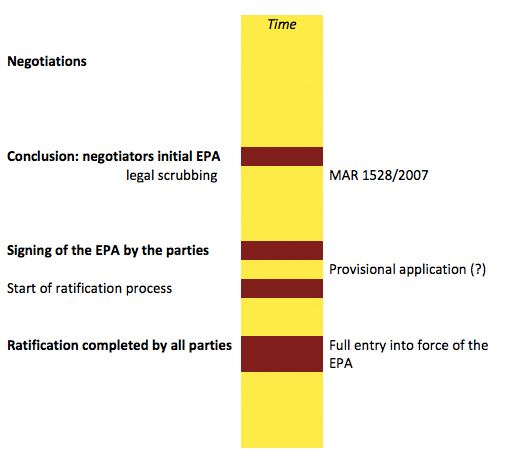 Does the deadline imply that EPA negotiations are over? No, the “deadline” of 1st October 2014 does not mean the end of EPA negotiations. The deadline only refers to the coverage of countries under MAR 1528/2007 after that date, as discussed above. EPA negotiations can still continue as necessary (i.e. for countries that have not yet concluded an EPA but would still wish to do so, and for EPA countries/regions that have rendez-vous clause to pursue negotiations on a broader scope in terms of content, such as trade in services, investment and other trade-related issues). Who will be covered by EPAs and what trade regimes will apply to my country/region after October 2014? With the exception of the CARIFORUM EPA, which is a comprehensive Agreement covering investment, services and a number of trade-related regulatory issues (from public procurement to competition and intellectual property rights, among others), all remaining EPAs cover only trade in goods and development cooperation. 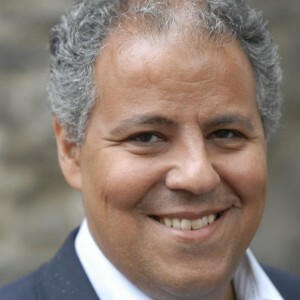 The rest are contained in a rendez-vous clause to continue negotiations on a number of issues, but there is no specific timeline for the finalisation of the negotiations. 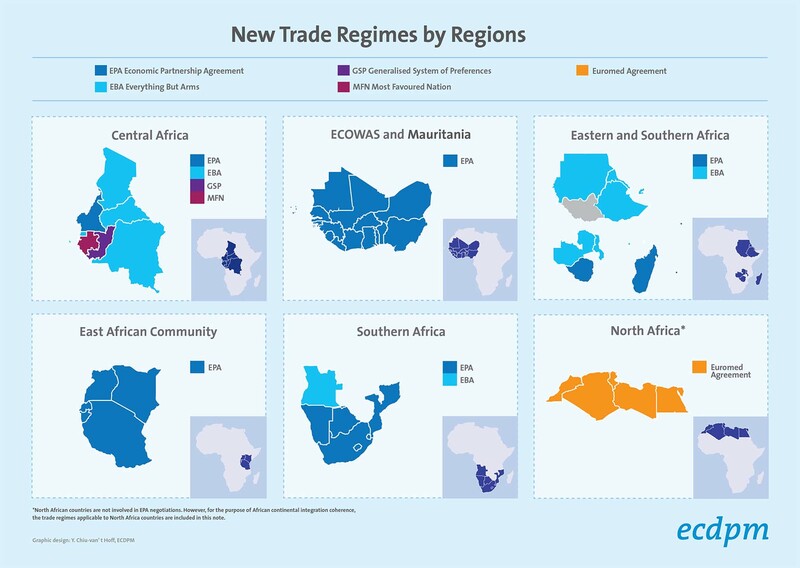 Who trades what in ECOWAS, SADC and EAC EPAs? What does the EPA contain? The EU provides immediate duty free and quota free market access to all products to EPA signatories (with the exception of South Africa, which has a less open regime with a longer time frame for liberalization). On the ACP side, markets are not fully liberalized. The degree of liberalization varies between 75% for ECOWAS countries and 98% in the case of Seychelles over up to 25 years, reflecting countries’ and regions’ level of development and capacity to open up their goods market. Regions excluded mainly products deemed sensitive for their domestic economies. These include agricultural products and some industrial products that are being produced at home. What are the main products excluded from liberalisation in SACU and ECOWAS? What were the key issues that were the more difficult to agree upon? EPAs have been widely debated. What were the key concerns? Products coverage and WTO compatibility: ACP countries and regions were required to open 80% of their market to the EU in order to be compatible with the requirements of the WTO (i.e. free trade agreements –FTAs- need to cover “substantially all trade”. This level of liberalization has been an important bone of contention for two main reasons: (i) while the WTO requires countries to liberalise ‘substantially all trade”, there is no set benchmark as to what level of liberalization is required. (ii) Many countries, notably in Africa, are low income countries, and therefore heavily depend on revenue from international trade taxes for budgetary purposes. Liberalizing trade would therefore have significant fiscal impacts on their economies. Policy space to industrialise: Most ACP countries that still need to diversity their economies and build their own productive capacities. It was felt that the EPA would further constrain countries to protect their domestic market, notably (i) by preventing the use of export taxes and (ii) limiting the ability of countries protect small or nascent industries through tariffs. Regional and continental integration: It was felt that EPAs might have a lock-in effect, that is, it binds countries within the region in which they have negotiated an EPA. Given the challenge of overlapping membership and the way EPA groups were constituted, it is unclear how this issue can be addressed, without putting at risk existing RECs. Additionally, at the continental level, the setting up of the Continental FTA will be affected by the fact that countries give more preferences to third parties outside the EU, compared to what they give to their own regional neighbours. 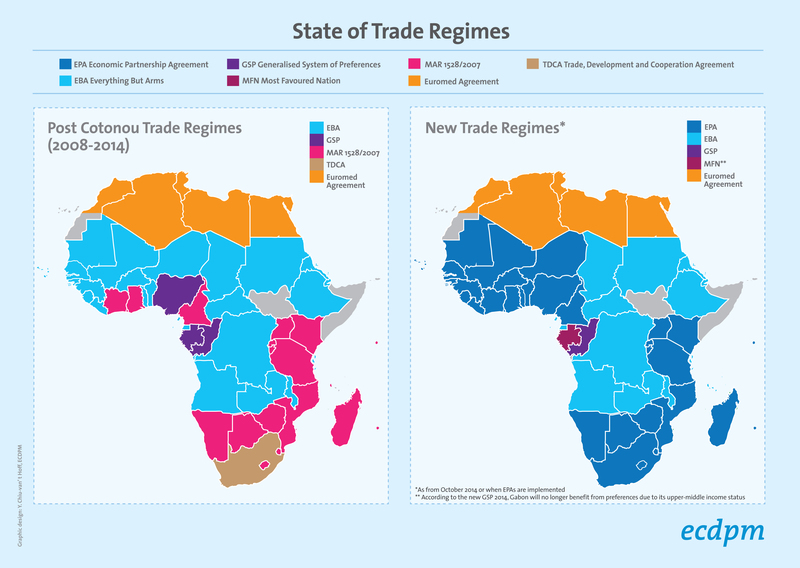 How to address the question of regional preferences while maintaining negotiating clout in the African Continental FTA (CFTA) process, will need to be addressed. EU’s trade deals with third countries: As part of its broader trade diplomacy, the EU is deepening trade ties with its key trading partners, as can be observed by the number of comprehensive trade agreements recently concluded (including with South Korea, Singapore and Canada). The current negotiations with the United States are likely to set different benchmarks for its future trade agenda, since the key stakes of the Trans-Atlantic Trade Partnership will not be around tariff negotiations, but rather around rules, standards and regulations. The first implication for EPAs is that it will gradually erode all margins of preference: tariffs in the EU are in any case very low, and soon, EPA signatories, despite their duty free quota free market access, will be faced with competition from other FTA partners of the EU. To many this means that all the benefits of the EPAs will be completely eroded, especially if EPAs remain focused on trade in goods. The second, and most important implication of these new “mega” trade deals for EPAs is that the tariff liberalisation effects of these new trade deals might be relatively modest. However, non-parties to these agreements will be confronted with changes in the regulatory landscape and would therefore become rule-takers. In the context of EPAs, despite the agreements in place, it is therefore feared that regions will constantly have to compete over higher standards and regulations to access the EU market, although market access per se is guaranteed. EPA Implementation: EPAs are not an end in itself. The next step is to implement the commitments taken and take steps to make use of the market access opportunities. Experience has shown, notably in the Caribbean, that the road to implementation is paved with good intentions, but also is also long, with many hurdles that need to be systematically addressed for countries to reap the full benefits of the agreement. This requires implementing the commitments taken, which may have, in the short to medium term, costs, such as revenue losses. Presentation – How to assess the West Africa EPA? BN – Economic Partnership Agreements: Towards the Finishing Line? Summary Report on the Consultative workshop on A Monitoring Process for the implementation of EPAs. Economic Partnership Agreements: Where are we and what challenges for development? Economic Partnership Agreements: Where are we and which way forward?